What are HDL and LDL? How do I know what my HDL level is? What should my HDL level be? Eat a healthy diet. 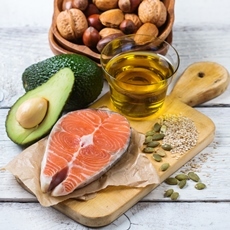 To raise your HDL level, you need to eat good fats instead of bad fats. This means limiting saturated fats, which include full-fat milk and cheese, high-fat meats like sausage and bacon, and foods made with butter, lard, and shortening. You should also avoid trans fats, which may be in some margarines, fried foods, and processed foods like baked goods. Instead, eat unsaturated fats, which are found in avocado, vegetable oils like olive oil, and nuts. Limit carbohydrates, especially sugar. Also try to eat more foods naturally high in fiber, such as oatmeal and beans. Stay at a healthy weight. You can boost your HDL level by losing weight, especially if you have lots of fat around your waist. Exercise. Getting regular exercise can raise your HDL level, as well as lower your LDL. You should try to do 30 minutes of moderate to vigorous aerobic exercise on most, if not all, days. Avoid cigarettes. Smoking and exposure to secondhand smoke can lower your HDL level. If you are a smoker, ask your health care provider for help in finding the best way for you to quit. You should also try to avoid secondhand smoke. Limit alcohol. Moderate alcohol may lower your HDL level, although more studies are needed to confirm that. What we do know is that too much alcohol can make you gain weight, and that lowers your HDL level. What else can affect my HDL level? If you are taking one of these and you have a very low HDL level, ask your provider if you should continue to take them. Diabetes can also lower your HDL level, so that gives you another reason to manage your diabetes. Article: Rethinking good cholesterol: a clinicians' guide to understanding HDL.